At Miami Valley Smiles, we know the dentist is the last place you want to spend time, especially if you’re a kid! A trip to the dentist can be a source of anxiety, fear, and tears for many kiddos (even for many adults! ), but we want you to know even our youngest patients enjoy their time with us. Dr. Lance and our team are friendly and gentle and create a warm and comfortable environment for your whole family. We’ll make sure the smallest smiles are healthy so they can put their best face forward and achieve whatever they set their minds to. We also offer family appointment blocks so you can get the whole gang in to see us in a single visit! You should bring your baby in to see us around the time their first tooth emerges, usually around 12 months or one year of age. It’s important to wipe your baby’s gums after feeding and to brush their teeth as soon as they start to come in, and floss as soon as their teeth start to touch. Teething can be a difficult time, let us know if you need any advice on how to get through it. When baby teeth are not properly cared for, they can develop baby bottle tooth decay which can cause problems for their baby teeth as well as the development of their adult teeth later on. You should continue to brush and floss your little one’s teeth for them until they are able to do so themselves. This usually corresponds with the ability to tie their own shoes, usually around age six. Once they take the reins, you should continue to supervise brushing and flossing until you are confident in their ability to do so effectively. 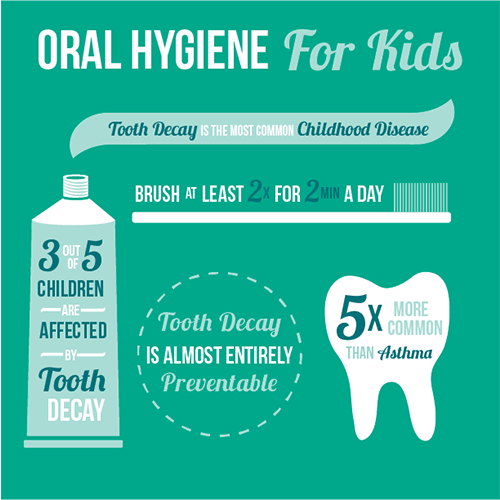 As your little one becomes not so little, their dental concerns may change as well. As they grow and become more self-aware, they may become concerned with the health and attractiveness of their smile. If their adult teeth didn’t come in perfectly straight, no worries, we offer Invisalign Teen to straighten their smile quickly and invisibly. We also offer custom mouthguards so you can feel confident they are protected when you’re cheering them on from the sidelines. If you have any questions about pediatric dentistry or would like to schedule an appointment with your Mason children’s dentist, Dr. Lance at Miami Valley Smiles, give us a call today at (513) 445-4064 or request an appointment online below! We look forward to smiling with you.